If Hillary Clinton last week wanted to work the refs—or argue with the press to generate more skeptical coverage of Barack Obama and maybe change the subject from her own problems—the evidence suggests it worked. 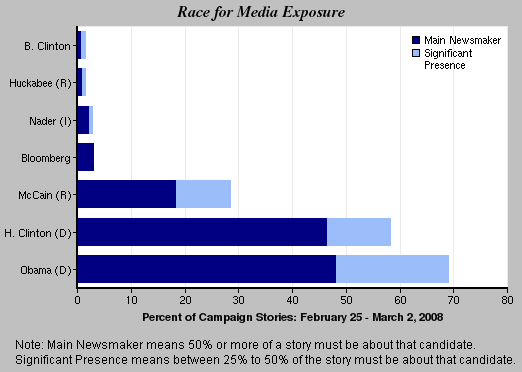 Clinton finished second in the derby for media exposure last week, registering as a significant or dominant figure in 58% of the campaign stories, a high water mark for her as well. And after weeks of tough coverage, Clinton may been relieved last week to find the media narrative focused more on her attacks on Obama than her 11-contest losing streak since Super Tuesday. Last week’s campaign coverage also reflected what has become a one-party nomination fight. With the GOP battle widely considered over, Democrats generated more than four times the coverage of Republicans (68% to 15%). Presumptive Republican nominee McCain was at 28%, his lowest total in five weeks and a 10-point drop from last week. With McCain’s nomination a virtual certainty, his coverage last week took some strange detours. That included his high-profile repudiation of a conservative talk host who launched a vitriolic assault on Obama and the mini-flap over whether McCain’s birthplace—the Panama Canal Zone—ran afoul of eligibility requirements for a U.S. President. Mike Huckabee, who was written off by the media in the early stages of the campaign and again before his surprising Super Tuesday wins, appears to have been counted out for the third, and probably final, time by the press, registering at about 2%. 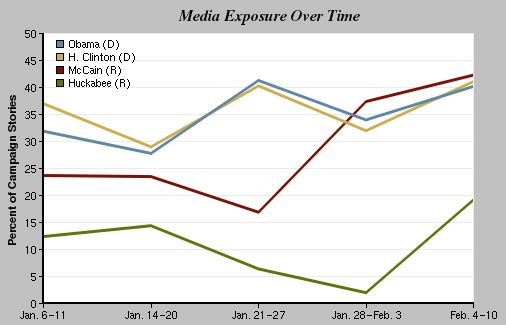 That means Huckabee generated less media attention last week than a candidate who never entered the race. New York Mayor Michael Bloomberg’s formal announcement that he was not running helped him register at 3%. That was about the same level of coverage (3%) that greeted Ralph Nader’s decision to make his fifth consecutive bid for the White House. And no doubt to the frustration of his devoted followers, one other GOP candidate who has not yet dropped from the race failed to attract the media’s attention. Ron Paul, the Texas Congressman, generated zero coverage as measured by PEJ’s Index last week, marking at least the seventh straight week he has finished with less than 1% of coverage. 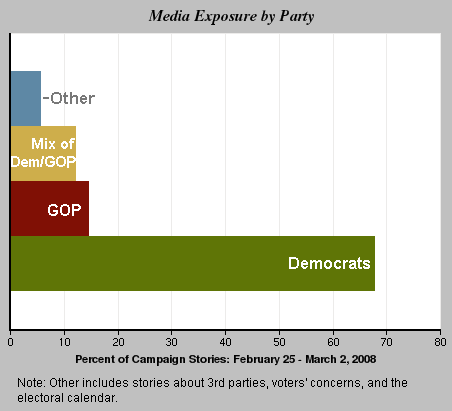 Even with the Democrats getting extensive attention, the focus away from the GOP is a major reason why the campaign accounted for its lowest share of the weekly newshole (38%) in 2008, according to the News Coverage Index from Feb. 25-March 2. (The previous low was 39%.) Again, cable TV—which devoted 59% of its time to the subject last week—was the media sector most interested in the election. In the good coverage and the bad for Clinton last week, the portrayal was consistent—a fiery candidate in full combat mode. A Feb. 25 report by CNN’s Candy Crowley on the increasingly tough tactics included video of a Clinton speech suggesting that Obama might not be better prepared for the presidency than the current White House occupant. “The unkindest cut of all, a comparison to George Bush” observed Crowley. The next day, on ABC’s Good Morning America, correspondent Jake Tapper explored the controversy over the photo that surfaced of Obama wearing traditional African garb, with the Obama campaign blaming the Clinton campaign and the Clinton team denying any knowledge of the photo. “The stakes are very high and the fight is getting nasty,” was Tapper’s evaluation. Two converging factors may have contributed to the tenor of Obama coverage last week—the Clinton campaign’s increasing complaints about media bias and journalists’ sense that with Obama now a clear frontrunner, the time was nigh for a more thorough scrubbing. It is also possible, as well, that the narrative about a faltering Clinton campaign had become familiar. The Feb. 25 edition of ABC’s World News Tonight featured Terry Moran’s analysis of Obama’s record in the Illinois State Senate, which included some substantive achievements and the 129 “present” votes on various bills. “Former colleagues say the picture is mixed,” said Moran. Three nights later, Dean Reynolds’ CBS report went much deeper, looking at everything from Obama’s Illinois career and performance in the U.S. Senate to his relationship with Louis Farrakhan (whose support Obama has rejected) and continuing whispers that he is a Muslim. “Questions persist about Barack Obama’s identity, who he really is,” declared Reynolds. When the media weren’t vetting Obama’s record, they were questioning their own treatment of him. Sooner or later in any mega-story, the performance of the media emerges as a major angle. With a breather in the primary schedule, that’s clearly what happened last week. The problem is that it’s much easier to pose a question about media bias than to answer it convincingly and credibly. Next to the campaign, the U.S. economy—staggering under more negative indicators, and stock market plunges—was the second-biggest story last week, filling 7% of the newshole as measured by the News Coverage Index for Feb. 25-March 2. That was followed by the conflict in Afghanistan (3%), where the news that England’s Prince Harry had been stationed there was the driving factor. Next came events inside Iraq (3%) and the Academy Award ceremonies, also at 3%. Note: Due to technical recording errors, this week’s sample does not include the following radio programs from Thursday, February 28, and Friday, February 29: Rush Limbaugh, ABC News Radio Headlines, and CBS News Radio Headlines. Also, the sample does not include Sean Hannity’s radio program from Thursday, February 28.